Protest for Robert McCulloch’s recusal: The St. Louis prosecutor is accused of long-standing and personal police bias. Demonstrators say St. Louis prosecutor Robert McCulloch has a long-standing and personal bias in favor of the police. A demonstrator chants, “No justice, no peace,” in front of the St. Louis County prosecutor’s office. 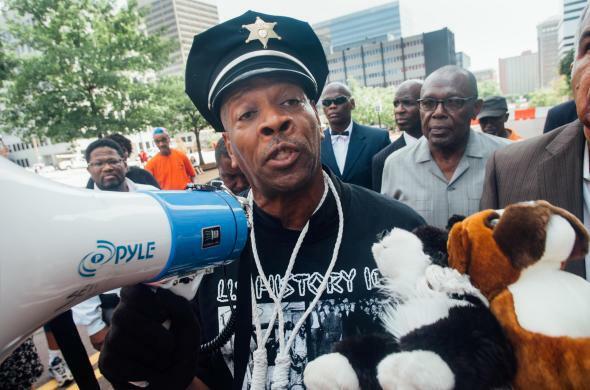 CLAYTON, Missouri—Spencer Booker wants Robert McCulloch gone. “The goal of this demonstration was to send a clear message to the governor: We don’t want Mr. McCulloch on this case. Let’s get a special prosecutor, and let this investigation take its course,” said Booker, a reverend at a nearby African Methodist Episcopal church. Both Davis and Booker were part of a demonstration Thursday afternoon, demanding that Gov. Jay Nixon remove McCulloch—the prosecuting attorney for St. Louis County—from the investigation into the fatal shooting of Michael Brown. The protest was small—a little more than 100 people had gathered at McCulloch’s Clayton, Missouri, office—but it came with wide support: Protesters and local groups have already collected 70,000 signatures calling for the prosecutor’s removal. Given the essential role McCulloch will play in what is to come, these demonstrations may now be the most important protests for the people of Ferguson. But supporters of the Brown family are skeptical, pointing to McCulloch’s personal and professional history. To start, he has a close familial connection to violence. In 1964 his father—a police officer—was shot and killed by a black man in a public housing complex, which critics say affects his judgment of police brutality cases. In particular, they point to a case in which McCulloch declined to bring charges against two detectives accused of excessive force in the killing of two unarmed black men. And on Monday he praised police for how they’ve handled protests. “The abuse that they took on that line was incredible,” he said, in reference to the SWAT and riot teams on call in Ferguson in the early days of the protests. And while he added a caveat that the show of force may have been unnecessary as the week progressed, he didn’t think police behavior was beyond the pale. “The use of force, while they were doing it under the circumstances, I don’t think was excessive,” he said. With that said, there’s a chance Nixon would bow to public pressure. After all, even with the disorder, sustained protests on West Florissant worked to force a response from the governor’s office, as well as other state and federal officials. Consistent calls for a special prosecutor—in addition to regular demonstrations—could force Nixon to act. For my part, benching McCulloch makes sense. Given Missouri’s extremely high bar for prosecuting police officers, odds are good for disappointment in the grand jury investigation, which began Wednesday and will conclude in the fall. Still, a world where McCulloch declines an indictment looks a lot worse to the Ferguson community than one where someone else does the same. For the sake of public peace, a special prosecutor might be worth whatever political price it costs. Read more of Slate’s coverage of Ferguson.